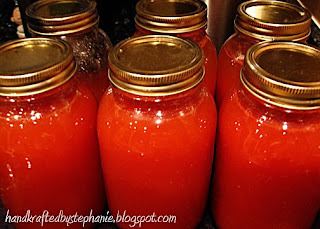 After my first canning adventure went pretty well, I decided to make tomato juice. I got the directions again from my SIL, Mary (aka The Canning Expert). Unfortunately, tomatoes don't exactly grow that well here (that I know of), so I headed to Sprouts Farmers Market and bought 24 lbs. of CA hothouse tomatoes earlier this week. These tomatoes would ordinarily be almost guaranteed to be sweet and juicy, except for the fact that they were picked too early and likely put in cold storage before making it over the state line. Still, I figured that I would ripen them and at least give it a try. I had originally planned on making the tomato juice today, but yesterday I happened to pass by the tomatoes (which were in cardboard boxes on my dining table). Some had actually ripened too much (ewww), and I had to toss a few out. 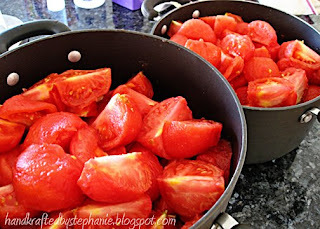 So, at noon yesterday, I started blanching tomatoes. The actual process was not difficult, though it took me awhile to crank them through the food mill. Three and a half hours later, I went from 2 pots of cut up tomatoes (top) to these 5 1/2 quarts of bright red tomato juice... mmm... I can't wait to try it out!